When working with C# and .NET in a Xamarin.Mac application, you have access to the same User Controls that a developer working in Objective-C, Swift and Xcode does. 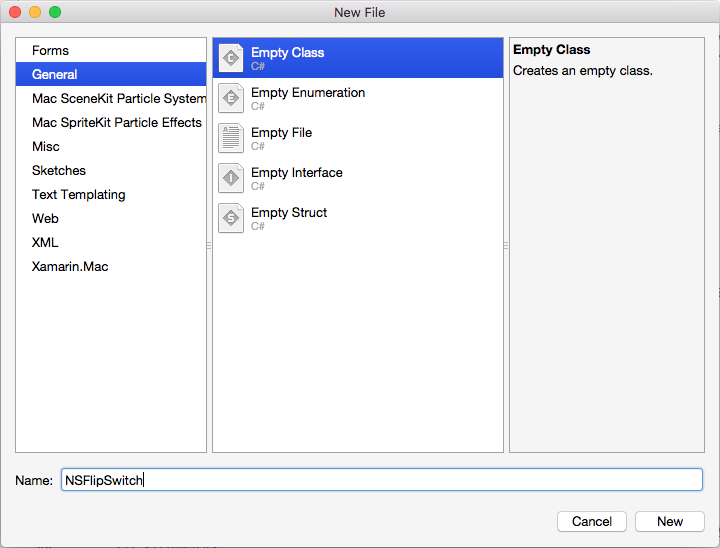 Because Xamarin.Mac integrates directly with Xcode, you can use Xcode's Interface Builder to create and maintain your User Controls (or optionally create them directly in C# code). While macOS provides a wealth of built-in User Controls, there might be times that you need to create a custom control to provide functionality not provided out-of-the-box or to match a custom UI theme (such as a game interface). In this article, we'll cover the basics of creating a reusable Custom User Interface Control in a Xamarin.Mac application. It is highly suggested that you work through the Hello, Mac article first, specifically the Introduction to Xcode and Interface Builder and Outlets and Actions sections, as it covers key concepts and techniques that we'll be using in this article. As stated above, there might be times when you need to create a reusable, Custom User Interface Control to provide unique functionality for your Xamarin.Mac app's UI or to create a custom UI theme (such as a game interface). In these situations, you can easily inherit from NSControl and create a custom tool that can either be added to your app's UI via C# code or through Xcode's Interface Builder. By inheriting from NSControl your custom control will automatically have all of the standard features that a built-in User Interface Control has (such as NSButton). If your custom User Interface control just displays information (like a custom charting and graphic tool), you might want to inherit from NSView instead of NSControl. No matter which base class is used, the basic steps for creating a custom control is the same. 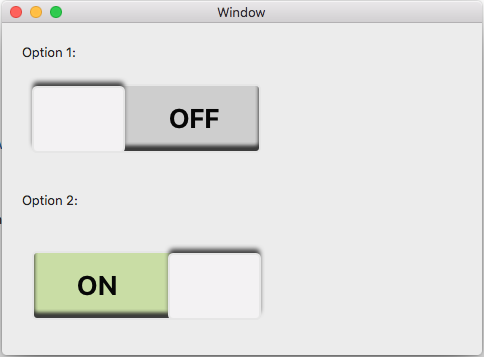 In this article will, create a custom Flip Switch component that provides a unique User Interface Theme and an example of building a fully functional Custom User Interface Control. Since the custom control we are creating will be responding to user input (left mouse button clicks), we are going to inherit from NSControl. In this way, our custom control will automatically have all of the standard features that a built-in User Interface Control has and respond like a standard macOS control. In the following sections, we'll take a look at the rest of the above code in detail. When the state of the switch changes, we need a way to updated the UI. We do that by forcing the control to redraw its UI with NeedsDisplay = true. If our control required more that a single On/Off state (for example a multi-state switch with 3 positions), we could have used an Enum to track the state. For our example, a simple bool will do. Later, we'll expand this helper class to inform the caller when the switches state has changed. We'll be adjusting the visual representation for the control when its state changes (such as going from On to Off). Any time the state changes, we can use the NeedsDisplay = true command to force the control to redraw for the new state. There are two basic way that we can add user input to our custom control: Override Mouse Handling Routines or Gesture Recognizers. Which method we use, will be based on the functionality required by our control. For any custom control you create, you should use either Override Methods or Gesture Recognizers, but not both at the same time as they can conflict with each other. // Handle mouse with Override Methods. // NOTE: Use either this method or Gesture Recognizers, NOT both! In the above code, we call the FlipSwitchState method (defined above) to flip the On/Off state of the switch in the MouseDown method. This will also force the control to be redrawn to reflect the current state. // Handle mouse with Gesture Recognizers. // NOTE: Use either this method or the Override Methods, NOT both! Here, we are creating a new NSClickGestureRecognizer and calling our FlipSwitchState method to change the switch's state when the user clicks on it with the left mouse button. The AddGestureRecognizer (click) method adds the Gesture Recognizer to the control. Again, which method we use depends on what we are trying to accomplish with our custom control. If we need low level access the to user interaction, use the Override Methods. If we need predefined functionality, such as mouse clicks, use Gesture Recognizers. When the user changes the state of our custom control, we need a way to respond to the state change in code (such as doing something when clicks on a custom button). First, we provide a ValueChanged event that we can add a handler to in C# code so that we can perform an action when the user changes the state of the switch. First, we check to see if an Action has been assigned to the control. Next, we call the Action if it has been defined. With our custom control fully defined, we can either add it to our Xamarin.Mac app's UI using C# code or in Xcode's Interface Builder. Here, we respond to the ValueChanged event we defined above on the NSFlipSwitch class and write out the current Value when the user clicks on the control. You should use either the Event or define an Action in Interface Builder, but you should not use both methods at the same time or they can conflict with each other. This article has taken a detailed look at creating a reusable Custom User Interface Control in a Xamarin.Mac application. 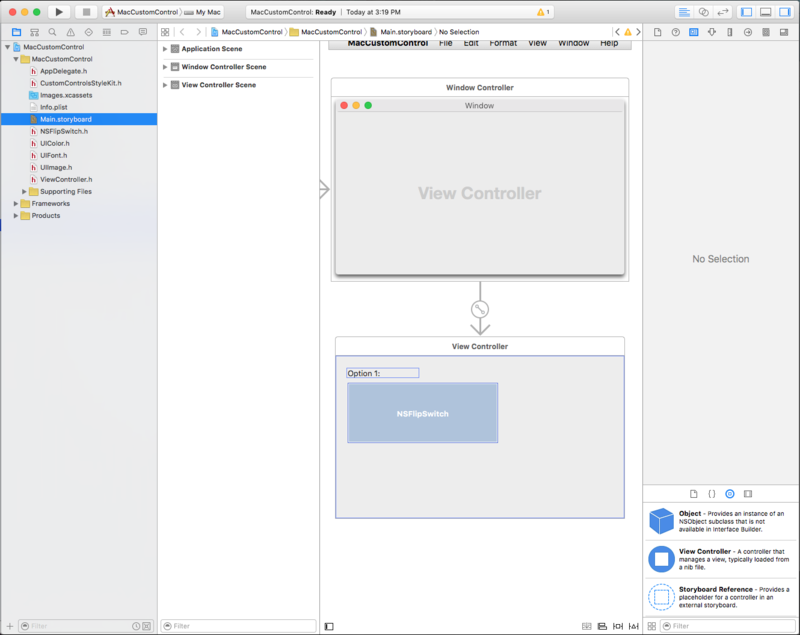 We saw how to draw the custom controls UI, the two main ways to respond to mouse and user input and how to expose the new control to Actions in Xcode's Interface Builder.